Born at Laurel Hill in Ararat, Virginia, on Feb. 6, 1833, James Ewell Brown Stuart attended school in Wytheville and Emory and Henry College. After graduating from West Point in 1854, Stuart served as a second lieutenant in the U.S. Army. At the outbreak of the War Between the States, he joined the Confederate Army as a colonel in the 1st Va. Cav. He was later promoted to major general in command of all cavalry in the Army of Northern Virginia. Wounded in battle, Stuart died on May 12, 1864, and is buried in Richmond, Virginia. 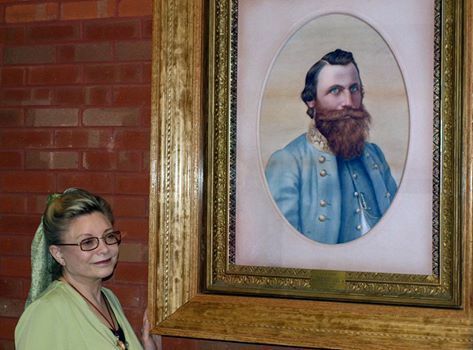 The portrait was removed from the Patrick County Courthouse on August 19, 2015, and hung on the Wall of Honor on May12, 2016. ELLEN DOUGLAS STUART, daughter of Dr. John Dabney Stuart and Anne Eliza Kent. Ellen was born in 1865 and thus never knew her uncle. She became a distinguished professor of fine arts at Baylor University in Dallas, TX.